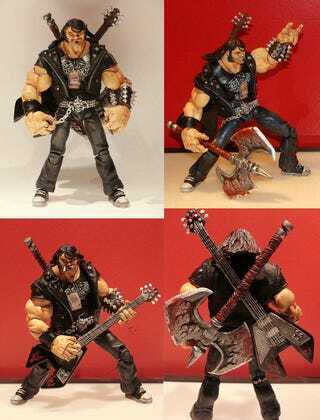 To cash in on the launch of Brutal Legend last year, EA had 1000 statues of the game's star, Eddie Riggs, made up. They were nice, but then...they were too nice. Too clean. Not metal enough. Reader Hugo thus decided to take matters into his own hands, and built himself an Eddie Riggs figure that would do justice to the character. For one, Hugo's Eddie is closer in girth to Rigg's real-life inspiration, comedian Jack Black. It's also an improvement for the fact it includes a cigarette, which I'd imagine was a must for any merch based off a roadie. And finally...from certain angles, he kind of looks like Matt Pike, from High on Fire. Which is also metal. And awesome.